A new species has established itself on our TV screens. This particular genus preens, struts, weeps, sulks and displays its hairy chest quite frequently. It is a diverse group but, cast as it is in this particular role, manages to behave with a degree of predictability. The judges of reality shows are a bona fide breed, having had enough time to grow in number and establish a pattern of behaviour. The group today boasts of people as illustrious (and otherwise) as Javed Akhtar, Jeetendra, Himesh Reshammiya, Bappi Lahiri, Sonu Nigam, Abhijeet, Farah Khan, Shiamak Davar, Shekhar Suman, Alisha Chinai and Navjot Singh Sidhu, to name a few. That list also includes Anu Maliik, who is one of a kind and needs separate mention. If not a major star from yesteryears, the celebrity judge is either a minor star in a major category (fringe actors such as Malaika Arora Khan, Isha Koppikar) or a major star in a minor one (singing, music direction, choreography, television). Several subspecies have sprung up among the judges. We have the “Chortling Cheerleader", whose ranks include Archana Puran Singh and Sidhu. Then there is the “Strutting Self-Promoter" who spends as much time glorifying himself as in pronouncing judgement. Maliik is the undisputed champion of this category, although Reshammiya might disagree and spend the next 15 minutes telling us why. There is the “Passive Mutterer" led by Udit Narayan and the “Emotional Embracer" exemplified by Ismail Darbar and Abhijeet. Nigam brings up the ranks of the “Always Agonized Expert", Arora Khan spearheads the “Pouty Pandit" category, flashing eyes and legs at the audience, while Bappi plays the “Beached Whale in Bliss" (but this he does all the time). Judging has two distinct elements—to judge contestants and for judges to project themselves as stars. The latter phenomenon produces a parallel reality show, where the judges put themselves on display, strutting about in resplendent plumage. For, in reality, the reality talent show contains an arena within an arena. The judges watch the contestants and, in turn, are watched by a larger audience. There is a studio audience, but it is almost always one that has no will of its own and exists to wave banners and dance badly. The judges, in effect, become contestants and strive to outdo each other in terms of gaining audience attention. The stakes are high, being a judge catapults a Name into a Face; everyone today knows what Ismail Darbar or Abhijeet look like. In many ways, just as contestants are small-town dreamers waiting to be transported to a magical world of 70mm fantasy, the judges themselves are awaiting metamorphosis from being sort-of-somebodies to bona fide targets for autograph seekers. The key response sought from a judge is to engage in conflict. Disagreement among judges is one of the key drivers of viewer interest; the more dramatic the disagreement, the better the spectacle. The Alisha Chinai-Anu Maliik bickering, Javed Akhtar’s face-off with Maliik, the undercurrent of gamesmanship underlying the exaggerated respect shown to each other on Sa Re Ga Ma Pa, all add to viewer involvement. Then there is the conflict that arises between judges and contestants. In most shows involving unknown contestants, this is limited to outbursts following rejection in the qualifying rounds (again, makes great TV as rejected participants mouth interesting obscenities, sometimes with parental involvement). It is when celebrities themselves are contestants that it becomes more complicated and fun. Mika, who is forever at loggerheads with the judges, is both intensely annoying and watchable, while Pooja Bedi sulks while she lisps, and sometimes, just for fun, vice versa. The biggest conflict has to do with the results of audience polls. In most shows, the judges’ authority evaporates after the first few rounds and they are reduced to sniping at participants and each other. The audience, that mindless behemoth, takes over and produces results that make even Maliik seem rational. This leads to much raving, ranting and petulant “walkouts" which miraculously get resolved by the time the next episode airs. Other minor conflicts feature the judges and anchors (uncommon, since most anchors are chosen so as to be a cunning combination of vapidness, insincerity and a voice that comes from the inner recesses of the small intestine) and between the judges and special invitees. Most invitees are there to promote their new releases and hence restrict themselves to gushing about the contestants. However, in some odd cases, such as the one involving Asha Bhonsle on Sa Re Ga Ma Pa, the conflict becomes a particularly bloody one. The talent show confers authority on the judges, but stops short of making it absolute. It is this fluid nature of authority that gives the show its spectacle value. The judges have to navigate other judges and the audience and, in doing so, become performers as well as evaluators. On the one hand, the contestants show them exaggerated deference, with even celebrity contestants slipping into a subordinate role with effortless ease (in the dance shows they routinely fall over themselves in servile gratitude when Saroj Khan whistles in appreciation), and on the other, the judges try very hard to create a constituency for themselves among the audience. As this breed multiplies, it is likely to evolve. It is a jungle out there, and in celebrity-judge land, the species is becoming more interesting. Santosh Desai is the CEO of Future Brands. Last year, on the sets of Sony TV’s dance reality show ‘Jhalak Dikhhla Jaa’, judge Sanjay Leela Bhansali became known for showering praises. He told television actor Shveta Salve: “You have all the qualities of a dancing heroine. After Madhuri Dixit, you’re the best dancer in India." Salve lost to Mona “Jassi" Singh but then opened her own dance school in a Mumbai suburb. While one of the episodes of Sony’s ‘Indian Idol 2’ was being filmed, judge Sonu Nigam got miffed at the channel’s choice of song for a contestant. Neha Kakkar, the contestant, was asked to sing ‘Zubi zubi zubi’ from the 1987 Mithun Chakravarty-starrer ‘Dance Dance’. He flared up, and abused the crew. The contestants were startled and burst into tears. Himesh Reshammiya took the opportunity to apologize to Asha Bhonsle for his criticism of R.D. Burman’s “nasal" voice on one of the episodes of Zee TV’s ‘Sa Re Ga Ma Pa Challenge’. Bhonsle had expressed her anger at Reshammiya’s statement about her late husband. On live television, she behaved gracefully, but both the judges continued to quibble throughout the show. Last year, choreographer Saroj Khan essayed her role as a judge on ‘Nach Baliye’, the dance reality show on Star Plus, with typical filmy histrionics. After the TV actor couple Rajeshwari and Varun Badola performed a dance where they switched gender roles, Khan stunned everyone by walking up to them and giving them each Rs101 as a personal prize and blessing. It became her signature on the show. At an audition of Sony’s ‘Indian Idol 3’, Anu Maliik gave full marks to Subhangi, a contestant from New Delhi. Javed Akhtar wasn’t impressed with her talents and accused Maliik of judging her solely on her looks. 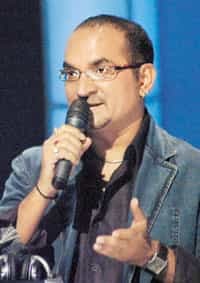 A heated argument followed, where Akhtar got support from the other judges, Alisha Chinai (with a history of animosity towards Maliik) and Udit Narayan, and the contestant in question was eliminated.